If you're like me, you are always working and stewing over your next idea for a picture book story. Problem is that just typing it line after line leaves you kind of wanting more from your text. That's where my picture book dummy kit solves this problem. No thinking how will I lay out my book, how many pages, where does the copyright page go--where do I start? It's all in my kit! What's great is you only have to print out the pages and follow the helpful tips and instructions and you're off to begin seeing and holding your book in your hands. 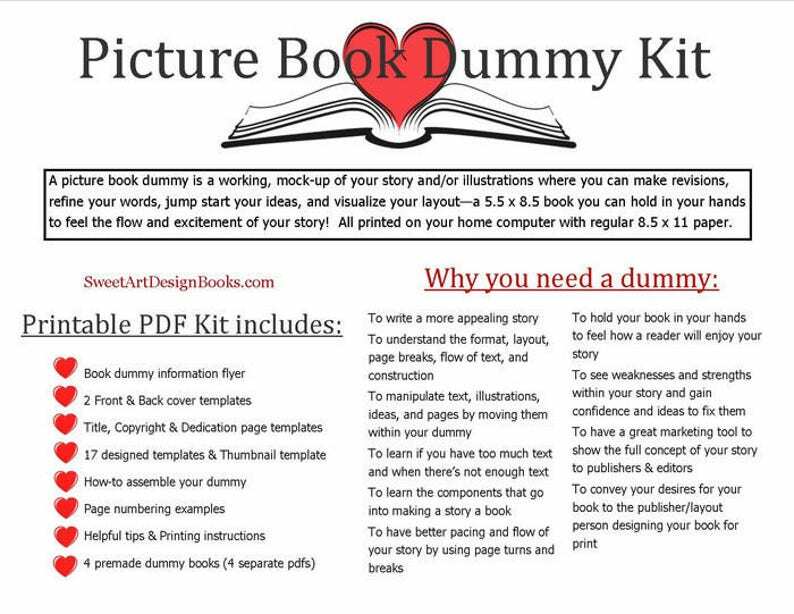 Then you can begin to work your text, insert your ideas, see the flow, where to make page breaks and page turns to enhance your story's excitement--all to have a working, physical mock-up of your book! I've been where you are, believe me, it's the best tool in creating the best books . . . giving yourself confidence in knowing you have the most appealing book you can! Once payment is received, my downloads will become instantly available. I don't offer refunds of digital downloads, but please feel free to contact me if you have any questions. I am happy to assist you and offer all my expertise.